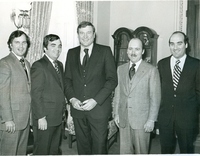 Picture of Mayor Richard M. Daley, Dan Rostenkowski, Lech Walesa, and Governor Jim Thompson at Solidarity Rally. Dan Rostenkowski taking a picture with Richard J. Daley's son's. Rostenkowski speaking at podium with Mayor Richard M. Daley in background.